Just a little note to let you know that I started a bartending position at Progressive Field on June 29, 2011. I am located at what is called the "HOT CORNER BAR" #176. 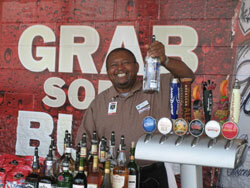 It is the first bar on the right hand side as you enter the gates across from Quicken Loans Arena on the Ontario side. I have also placed an application at the Cleveland Browns Stadium, and I plan to do the same at Quicken Loans when they start accepting them. THANK ALL OF YOU for your continued support. I have really enjoyed the training and the instructors. A very special thanks to Milton!!!!!! !